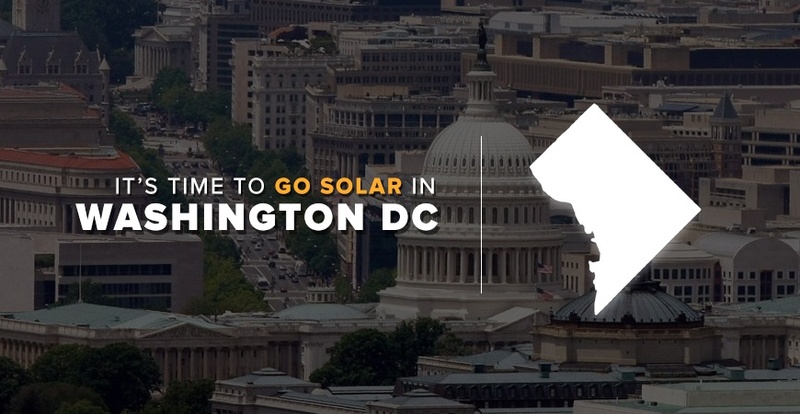 It's Time to Consider Going Solar in Washington D.C.
DC has become one of the most attractive areas to go solar. Here’s why: Washington DC has experienced a sustained SREC (Solar Renewable Energy Credit) shortage, which in turn provides favorable market conditions for SREC producers. The price of SRECs traded in DC have been steadily increasing since late October, and recently hit $450 per credit. 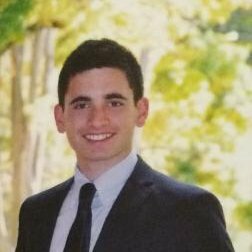 For context, current SREC prices in Massachusetts, the next most attractive SREC market in the country, are currently $270. Want to learn more about what SRECs are and how you can participate in the savings? We’ve got you covered. Why Go Solar in DC? 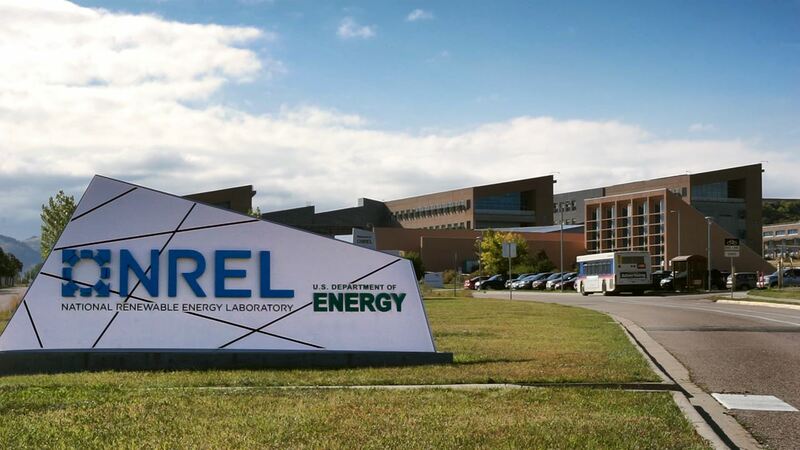 As clean energy becomes increasingly popular, many states have instituted renewable portfolio standards (RPS), which mandate state utilities to source a certain portion of their electricity from renewables – such as solar. The renewable portfolio standards in DC mandate that 50% of energy in DC comes from renewables – 5% of which is specifically designated to come from solar (see the chart below for additional information). Rather than having to produce the entire clean energy quota in-house, the utility companies buy electricity from renewable energy system owners in the form of a renewable energy credit (REC). The utility companies are not buying the energy itself, but rather purchasing proof of clean energy production. In the case of solar, for each 1 MWh (1,000 kWh) of energy produced, the system owner receives one solar renewable energy credit (SREC) – which the utility company buys in the form of a SREC. What Kind of Solar Savings Can You Expect? For a typical 5 kW home solar system, you can expect to earn on average about six SRECs per year (depending on your location and solar production conditions) – note that SRECs in DC have a shelf life of 3 years. Before you can sell your credits, you must first register your system. The easiest and most efficient way to do this is to go directly to an SREC aggregator, who will handle the registration of your system and the sales process of your credits. 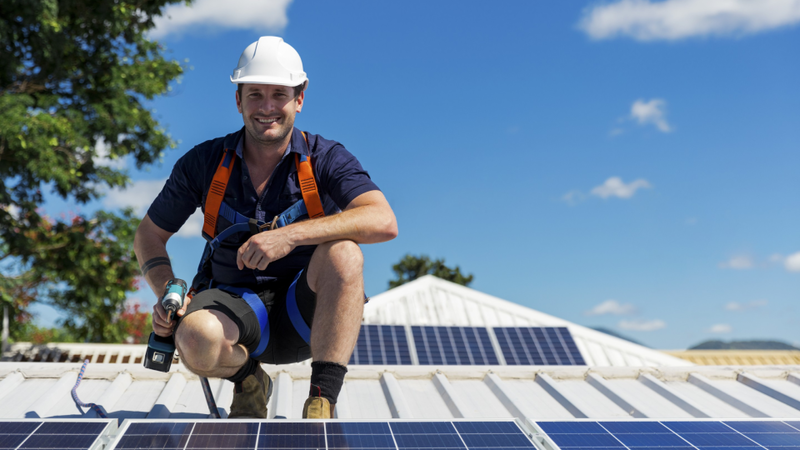 Some solar installers or financiers will register your system for you – some of which you can even sell your credits to. The general practice, however, is to go through a third party aggregator. Credits are generally sold in an open market, and thus the price is determined by supply and demand – the price range for SRECS spans from $4 to $480. Factors which determine supply include the number of systems producing energy, solar production conditions, and local REC/RPS laws. Since utility companies must meet quotas which extend far beyond the production capability of any one solar system, credits are usually aggregated and sold by a third party. Some utility companies, nevertheless, buy SRECS from the system owner directly. If utility companies fail to comply with the quota, they must pay a Solar Alternative Compliance Payment (SACP), which is presently set at $500 per megawatt-hour (in DC) – thus the price ceiling for SRECS is determined by the SACP. The DC SREC shortage can be understood as the result of bold solar initiatives, restrictive infrastructure, and a law preventing out of state producers from participating in DC’s SREC market. As mentioned earlier, the price of SRECs traded in DC have been steadily increasing since late October, to a most recent price of $450 (the graph below from srectrade.com tracks the price of SRECS). I’m going to emphasize this point again: current SREC prices in Massachusetts, the next most attractive SREC market in the country, are currently set at $270. Don’t be alarmed by the small price decline originating in mid-May – summer months have more hours of sunlight, which consequently increases the available supply of solar generated electricity. Legally speaking, DC has some of the most energy progressive laws in the country. RPS standards specify “solar carve-outs,” which require a prescribed amount of the renewable energy generation target to come specifically from solar. 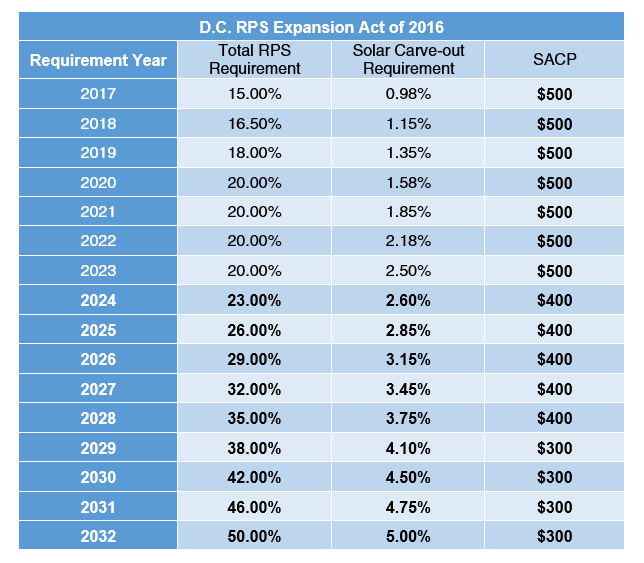 In 2016, DC passed the Renewable Portfolio Expansion Act, which provides for increased usage of renewable, and specifically solar, energy over the next several years (the chart below illustrates those requirements). The new legislation also enables the lower middle class to participate in the savings opportunities. Speaking at her press conference, Mayor Bowser said that the District “…will serve 100,000 low-income households by 2032—that’s more than 6,000 homes per year, and we’ll reduce their electricity bills by 50%, as a result. We’ll be creating at least 100 green jobs in the first year with that number growing every year through 2032. 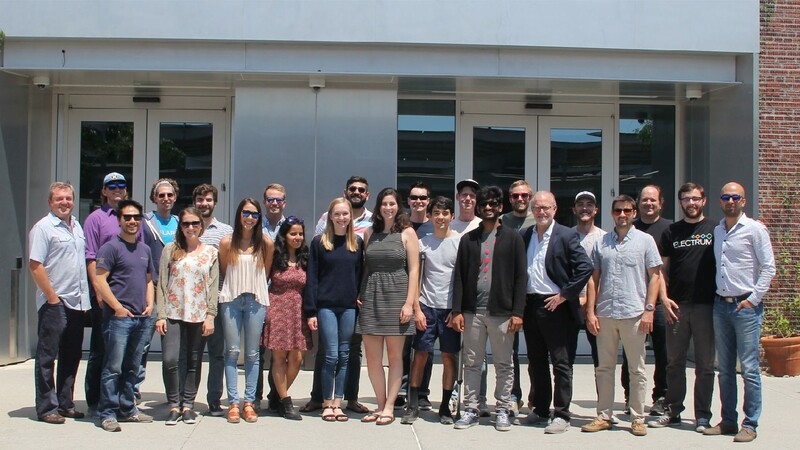 That means reducing carbon emissions, lowering residents’ energy bills, and providing pathways to the middle class through the burgeoning marketplace of clean energy – all at the same time.” All of the above show that right now is without a doubt the best time ever to go solar in the District. As SACPs decrease, so will the price of SRECS – so the time to maximize savings (and maybe even profits) is now!